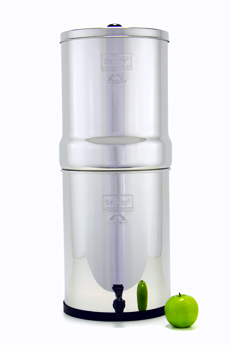 I recently purchased a Berkey Water filteration system from Jeff, The Berkey Guy, at a recent Self Reliance Expo. I was so excited to get home with my newest purchase. I purchased the Imperial, which is a beautiful stainless steel container, holding four Berkey filters and ability to hold 4.5 gallons of water. Upon arriving home I quickly unpacked it in all its glory, and assembled my newest purchase. It was easy to assemble, just had to screw in the four filters and install the spout. I filled the new shiny tank with tap water from our kitchen sink and let it start filtering. After a while I had enough water for a glass, about a cup. I emptied the water from the Berky into a clean glass and placed it in the fridge. I then did the same with a glass of tap water. I wanted there to be no difference other than the two glasses when it came to testing. After it was cool I poured cold refrigerated tap water into an identical glass and proudly stood in front of my wife. I showed off the two glasses of water. Surely I will now be the hero, and not the crazy guy that just spent a bunch of money at the Expo. With two glasses of water in hand, and smirk of “I know I’m right” on my face I handed the glasses to my wife and said, “Now tell me which one you like”. Now my wife is a great cook and someone that can usually tell what ingredients are in a great restaurant dish just from tasting it. She drank from both. She stopped and tasted as I sat there anxiously waiting her reply. “I think I like this one best”. IT WAS THE TAP WATER. I was devastated. What?!! How can that be?! I grabbed the glasses from her hand realizing I hadn’t even tasted the samples myself, and drank the rest of water from each glass. She was right! What the heck. I checked the glasses to make sure I didn’t mix them up. Surely in my haste to prove my smartness I must have mixed them up. They were right, I hadn’t mixed up anything. I was so disappointed, I just put the glasses in the sink and went to bed. A week had gone by and I hadn’t touched my new filter even though it sat there on the counter full of fresh filtered water. I was getting ready to just take it down and put it away when I noticed my youngest daughter running over with her cup and filling it with the Berky filtered water. I kinda laughed a bit and thought, “I have a glorified kid water dispenser”. I went over and lifted the lid. To my surprise it was nearly empty. After investigating, I realized that my two youngest kids had been drinking from it all week. There was nearly four gallons of water that they drank. I explained to my wife what I had just discovered, hoping to reclaim my “All-Knowing” status. She looked at me and said, “well let’s just all test it for a week and see”. So for a week we drank from it and didn’t really notice a difference, except one. We all quit using ice in our water. So after forgetting to fill the Berkey up one night, I decided to just have a good ol’ cold glass of ice water from the fridge dispenser. It tasted like crap! I’m here to tell ya, disgusting. I felt like I was drinking dirty swimming pool water. I called my wife to show her my new discovery, to teach her a lesson about water! She looked at me with that “you’re late to the party” look and simply said, “I know, we figured that out after two days”. Moral of the story, your body and taste buds might be completely used to drinking tap water so it might take time for your body to acclimate to the new, much better for you, water. I will tell you this, when going to a friends house, you better take the smaller Berkey Sport bottle or you will have a tough time choking down dirty pool water with a smile!